If you’ve got a few minutes to spare while waiting for this year’s hot dog eating contest to start (no worries – we all know you watch it), you might want to take a look at this cool flash video that explains each of the 10 dimensions. I’ll warn you in advance: If you do watch the video, you may come away with your head hurting. That, or your head will explode. String theory is some pretty crazy stuff, with the infinite number of universes and all. 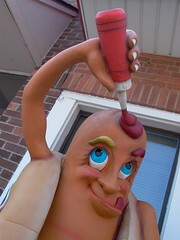 Is it just me, or are you hungry for hot dogs too?